Everyone loves a winner. So talk up your winning biz. You can take several routes. The humble way – Shucks, we’re just ordinary plain folk who got lucky. The hardworking drudge – Well, sure we’re a success, but all we do is work, work, work. And we never see our kids, spouses, or mothers. The boaster – I’m pretty fricken’ amazing. That’s it. I kickass. The passionate soul – I love this work. Man, I’d do it for free. It’s all I’ve ever wanted to do. And it’s a labor of love. Mary Beth Coudal and Cheryl Sandberg exchanged a few laughs at BlogHer in Chicago. Note: I say “we” because, sometimes people appreciate the ‘we’ better than the ‘me.’ Or at least, we think so. Who’s we? 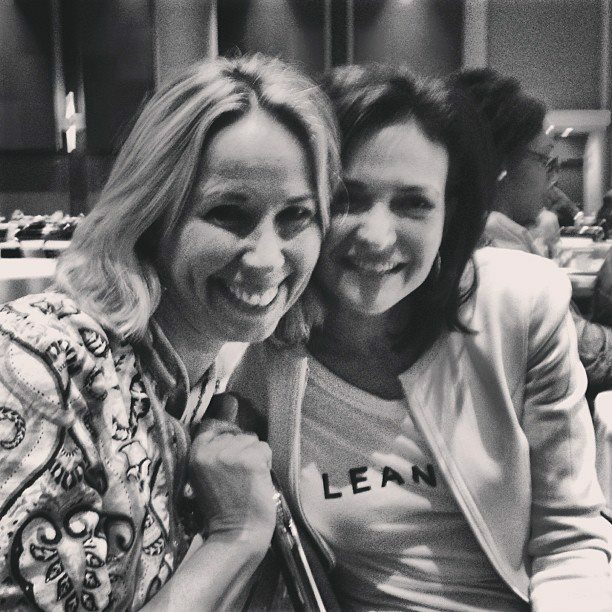 Me and Cheryl Sandberg of Lean In. I think she said something like this at BlogHer last summer in Chicago — how women are more powerful when we’re collaborative rather than competitive. Even though I’m pretty much a shop of one, I feel like I bring a team with me on my assignments. Ya know, I get by with a little help from my friends. This post was inspired from a post by Seth Godin, marketing guru. There’s plenty of “we” in you, Mary Beth! Love your enthusiasm, it’s contagious. I love the “we.” I think, though, that I abuse its power and put it everywhere. Last night I talked about when “we” adopted my dog…to a room full of people who know that I’m single! I made a joke about “me, myself, and I” and another one about how crowded it is in my head but I think I have to respect the power of “we” and dole it out more carefully! I’m drunk with the power of it!